This video Converter with BNC/VGA/S-video inputs and VGA output, which will convert VGA/S-video/BNC signals into VGA display signal. Signal switches easily between different input sources. 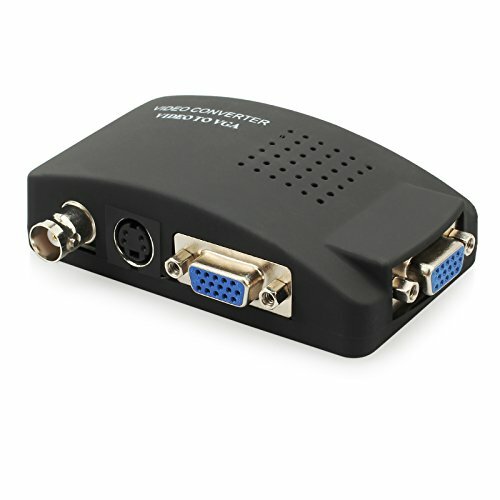 This converter box will convert VGA/S-video/BNC signals into a VGA display signal. Single button for switching between different input sources easily. "RESET", "MENU", "AV/SV/VGA", "PIP←", "MODE", "PP→" function button. Supported VGA resolution: 800x600@60HZ, 1024x768@60HZ, 1280x1024@60HZ, 1920x1080@60HZ. Convert VGA/S-video/BNC to VGA. It Allows You to Watch Online Videos, Play Computer Games and Surf the Internet Through TV as the Monitor. Adjust and Set Preferences with Onscreen Display and Front-mount Control Panel; Compact, Portable Size. Powered by USB Port - Includes Cable to Connect to Host PC. Plug and Play. Install In Seconds, Plug in Power and It Works, NO Need of Setting, Easy for Use, Powered by USB Port. All ESYNIC Product Come with 18-Month-Warranty and Lifetime Customer Support.